The music and hospitality pioneer, Chris Blackwell, has been honoured at a star-studded gala ceremony in Montego Bay, Jamaica. The founder of Island Records and Island Outpost was acknowledged with the “Lifetime Achievement Award” at the World Travel Awards (WTA) Caribbean & North America Gala Ceremony 2019. 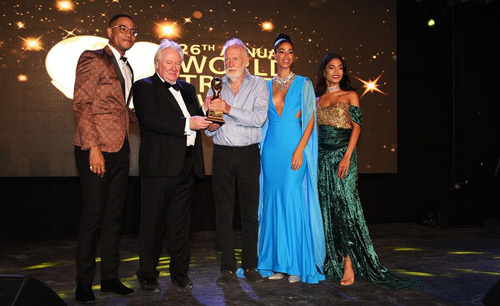 The red carpet evening, which was hosted at Sandals® Montego Bay, marked the opening leg of the WTA Grand Tour 2019 – an annual search for the finest travel and tourism organisations in the world. Winners at the ceremony included the paradise island of St. Lucia, which collected ‘Caribbean’s Leading Honeymoon Destination’, whilst Las Vegas fended off stiff competition to emerge as ‘North America’s Leading Destination’. Jamaica was named ‘Caribbean’s Leading Beach Destination’ and ‘Caribbean’s Leading Tourist Board’. Guests at the gala event enjoyed entertainment from the acclaimed queen of British soul, Beverley Knight and the Grammy-nominated reggae vocalist, Etana. The evening took place on the eve of the 37th edition of Caribbean Travel Marketplace. In the hospitality sector, winners included Tobago’s Coco Reef Resort & Spa (‘Caribbean's Leading Hotel’), Marriott Hotels (‘North America's Leading Hotel Brand’) and Conrad New York (‘North America's Leading Hotel’). The beachside refinement of Rosewood Baha Mar, Bahamas was acknowledged with award for ‘Caribbean's Leading New Resort’. The relentless drive to innovate helped Sandals to lift the title of ‘Caribbean's Leading Hotel Brand’. In the aviation sector, Caribbean Airlines was named ‘Caribbean's Leading Airline’, whilst Sangster International Airport, Jamaica walked off with ‘Caribbean’s Leading Airport’ and Air Canada was voted ‘North America's Leading Airline’. Events on the WTA Grand Tour 2019 include Abu Dhabi (United Arab Emirates), Madeira (Portugal), Mauritius, La Paz (Bolivia) and Phu Quoc (Vietnam). The regional winners will progress to the Grand Final 2019, which is being hosted in Muscat (Oman) on 28th November.